One of the first questions farmers have when they consider trying out a new crop is – is there a market for it? Will it be profitable? This is particularly the case in the corn belt, where markets for corn and soybeans are abundant and nearby, but markets for crops like oats, wheat and barley are not so obvious. Using data Practical Farmers of Iowa collected from farmers who participated in small grains cost share we were able to develop several enterprise budgets for small grains production in rotation with corn and other crops. 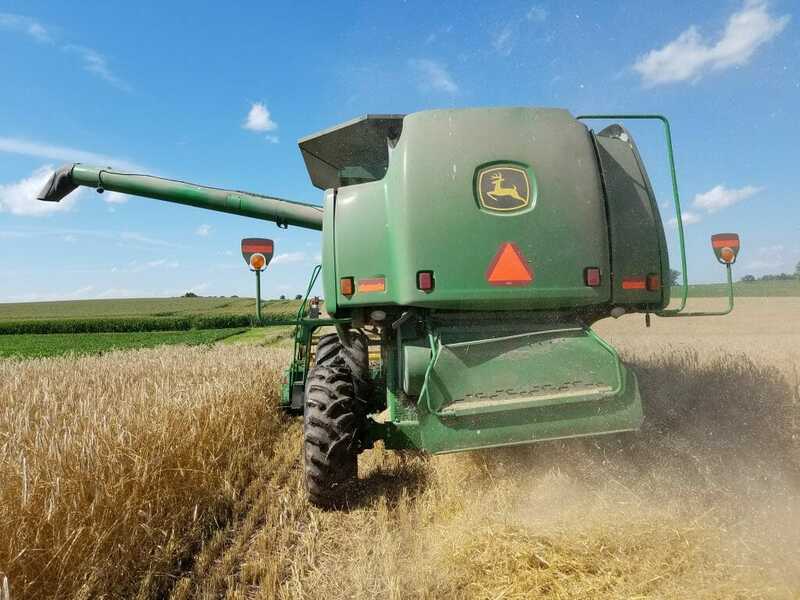 The budget I will go over in this blog demonstrates an example case of a highly profitable production system for conventional oat production in rotation compared to estimated cost of production budgets for a corn-soybean rotation from Iowa State University. Most farmers, including those who provided data toward this budget, would likely grow oats as part of a three-year rotation including corn and soybeans. Because we have not yet completed the 2019 crop season, we do not know if there will be profitability changes of the small grain rotation due to the soybean year though published research indicates that fewer weed control expenses and higher yields result in increased profitability of the full, three-year small grain rotation. Though we do not have data from the entire rotation, comparing these two-year systems – oats-corn and soy-corn – provides us with valuable insight into short term profitability of small-grain crops. In a quick glance at the revenues between the two rotations, we see that the small grain rotation offers far more opportunities for introducing new sources of revenue. 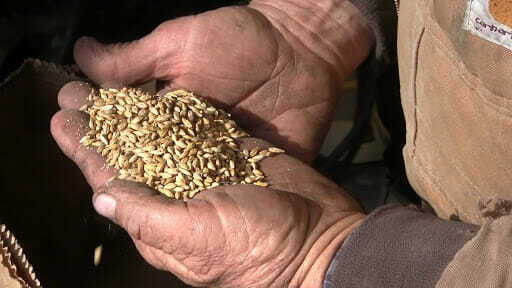 With harvest of straw from the small grain and forage from the cover crop, there are five sources of revenue in the small grain rotation versus only three in the conventional rotation. This means that while oat grain is indeed less profitable than soy grain at $389 of revenue versus soy’s $594, the oat year still comes out ahead of the soy in revenue at a total of $1,046 per acre. This not only increases gross revenue, but it also spreads risk between more income streams, insulating the profitability of the farm from a crop failure. It is important to note that the best practices collected in this budget involve easy access to livestock. Manure, hay and straw are all products that would be created by or used for animal production. The most cost effective method would be if these products were used on-farm in the same operation or sold to/bought from a nearby operation to keep transportation costs low. Transportation costs were not included in either the small grain or conventional budget, so any hauling would be directly subtracted from the net return on both sides of the comparison. The structure of crop fertility expenses is one of the biggest differences between the two systems. The conventional rotation relies on many cheaper inputs – N, P and K fertilizers, herbicides and lime – whereas the small grain rotation relies on manure and nitrogen generated by the legume cover crop. Manure costs are calculated as value of the nutrients per the market rates of 0.38 per pound of nitrogen, 0.42 per pound of phosphate and 0.31 per pound of potash so this number is more accurately comparable to purchased fertilizer. The cost of manure as calculated in this budget does not represent out-of-pocket expenses to the farmer for storing, treating or maintaining manure storage systems or the overhead costs of running an animal barn. Manure is often perceived as a waste or by-product of these other enterprises, so a farmer budgeting out a manure application from their own farm would likely only be accounting for the equipment and labor costs of manure application as “expenses” rather than considering the manure itself as an input with an associated cost. However, that manure is a valuable additive from a crop production perspective, so the representation in the budget seeks to quantify the value of this by-product by valuing what it would cost to purchase the manure or other fertilizers with the same nutritional content. 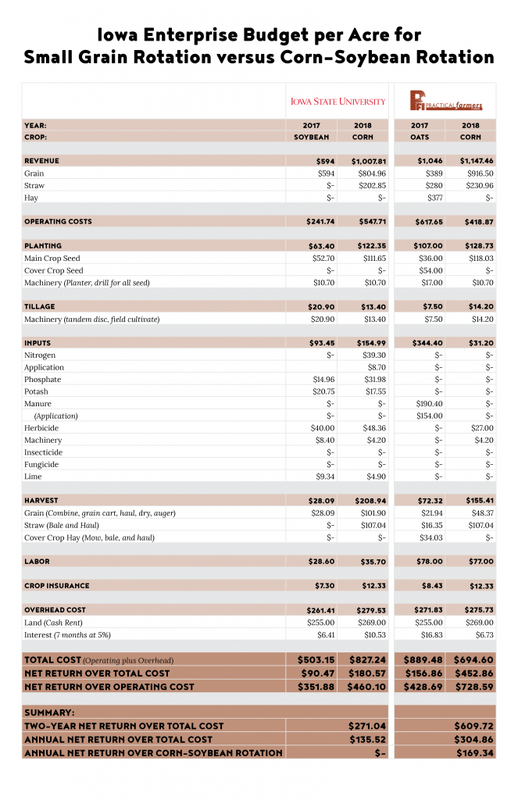 While the costs for manure at $344.40 are much higher than fertilizer costs in the conventional rotation ($147.48), the year-to-year accounting would not show this large of an expense for manure. Another confounding factor is the role of the legume cover crop in the production of nitrogen. For a spring terminated, solid stand of clover or alfalfa most farmers (see here and here) estimate an addition of 80 pounds of nitrogen to the soil system – though not all of this nitrogen is immediately plant-available. The seed cost of the legumes at $54 per acre contributes to reducing input requirements for fertilizers, but this cost cannot be wholly attributed to a crop nutrition expense line because of the opportunity it provides to make hay and the additional value it brings in weed control to the farm, discussed in the next section. In both rotations herbicides and tillage are used as management tools to control weeds. The conventional rotation employs herbicides for the sole purpose of weed control while the herbicides have a dual purpose in the small grain rotation – controlling weeds and terminating the legume cover crop. The same is true of tillage in both systems, it is used to control weeds, primary tillage for planting preparation and, in the case of the small grain rotation, to terminate the legume cover crop. As we might expect we see that tillage costs are comparable in the 2018 corn years of both rotations, but the soybean year tillage costs are notably higher than the oat year – this is because only one pass of a disc was used to prepare the seedbed in the oat year while two passes of more expensive tillage were used in the soybean year. When it comes to herbicide costs, the small grain rotation leverages the cool-season growing pattern of the oat and the legume cover crop to smother and out-compete weeds so fewer herbicides are required over the entire small grain rotation. “Another way we pay for this wheat crop,” Paul Ackley, a farmer from Bedford, says, “is hopefully we’ll get by with only one herbicide treatment.” The small grain rotation reflects this cost savings with only one herbicide application at $31 per acre while the conventional rotation logged $100.96 for total weed control. The small grain rotation had the additional expense of $54 per acre of cover crop seed which when added to the $31 per acre of herbicides still cost less than the herbicide expenses of the conventional rotation at $85. Plus the cover crop produced nitrogen to subsidize fertilizer expenses and hay at the same time, so it’s value was extended even further. Labor is another notable difference between the conventional rotation and the small grain rotation. There are twice as many hours of labor required to manage a small grain rotation with five revenue streams versus a conventional rotation with three. This is due to operations such as harvesting oat straw and harvesting the legume cover crop as hay. However, these additional operations occur outside the corn and soybean harvest windows which farmers cite as a potential benefit. Spreading out the labor through the year allows for a more consistent workload and a less frantic spring and fall when labor is scarce in Iowa due to high demand for planting and harvesting corn and soybeans. This also provides an opportunity for the next generation to transition onto the farm. With twice as much demand for labor and twice as much revenue there is the potential to add partners or employees into the operation. And with year-round management, this system could provide year-long employment rather than corn-soybean rotations which require only temporary or seasonal labor during the critical spring and fall windows.